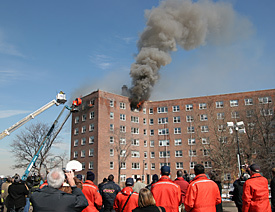 The fire protection of a complex building should always be considered as a whole. The provision of fire mains and dry risers is an essential element of fire protection systems due to the difficulties in providing water supplies at the point of use for fire fighting and search and rescue. At Ultrasafe we have nearly 15 years experience in designing and installing fire protection in domestic and residential buildings including many large and complex projects such as penthouses, care homes, student flats, listed buildings, national ancient monuments, historical heritage homes and schools. Dry risers are a key element in many of our installations. Our success is born out of our dedication to customer service. Using our knowledge and expertise we design and install bespoke fire protection systems suited to the individual requirements of each project. Dry riser systems are an integrated part of our fire protection systems. 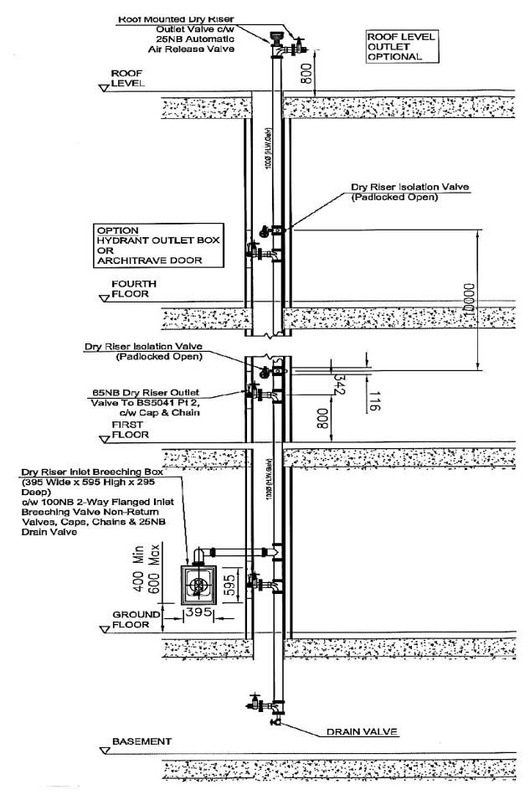 The dry riser installation typically consists of 1 no breeching inlet installed at entry or ground level to allow easy access for fire brigade connection. A ‘dry rising’ main is installed from ground level to feed various floor levels above and or lower ground. Landing valves are installed at every level in cabinets or exposed. lock and key with each, the front window is a wired glass window fixed with glazing rubber. The window is complete with Dry Riser identification as per BS 9990:2015. The cabinets will be either horizontal or vertically mounted. An air release valve is installed at top of riser to permit all air in the pipe work to be released as water is pumped into the pipe work. The valve will close automatically under water pressure. To conform to BS 9990:2015 Isolation valves are required at a maximum of every 10m of vertical rising mains pipework. The valves need to be chained and padlocked in the open position. These valves would not be monitored. A landing valve should be installed at each floor level on the rising mains. The landing valves provided at each level should not exceed 750mm above from floor level (Lowest point). Landing valves need to be manufactured to BS5041 Part 2, from gunmetal with screwed inlet connections to BS4504. Landing valves should be provided with leather strap and padlock to ensure they are normally closed. If you would like any further information or are interested in discussing the design and installation of Dry Risers please get in touch with us.